Over a million developers have joined DZone. If you don't know where to start, start with yourself and the 15% Solution Liberating Structure that begins with individual contributions. Join the DZone community and get the full member experience. Liberating Structures are facilitation techniques that allow you to unleash and involve everyone in a group — from extroverted to introverted and from leaders to followers. 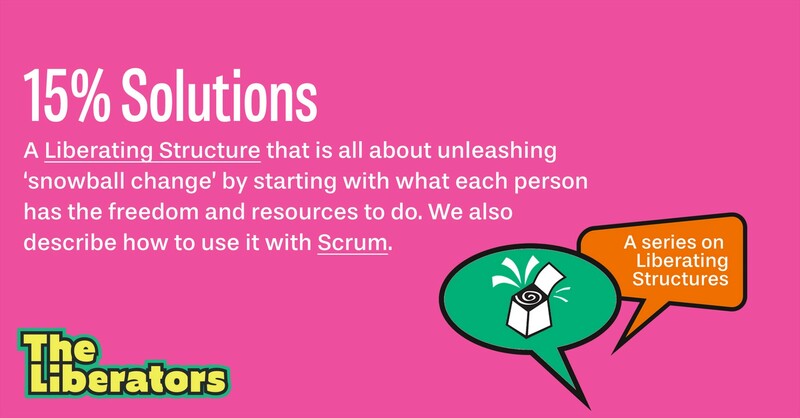 In this series of posts, we show how Liberating Structures can be used with Scrum. If you'd like to experience Liberating Structures first-hand, make sure to join our Immersion Workshop in Amsterdam (December 10 & 11) or one of the other ones taking place in Europe in December. "Even a 100-mile journey starts with a single step". This quote summarizes the power of 15% Solutions, a Liberating Structure intended to trigger big change by starting small. If you're like us, you'll recognize how easy it is to get lost in ambitious, over-the-top ideas that get bogged down in the realities of work. You may also recognize how easy it is to get lost in 'Yes, but ...'-thinking and focus on what isn't possible. Either way, you can go easier on yourself and your team by starting small. After all, you can change the course of a river by changing the position of a few rocks. 15% Solutions is about changing the flow of the river by moving a few rocks. In this post, we explore a deceptively simple Liberating Structure called 15% Solutions. Rather than identifying what we have to improve as a group, we draw attention to how we — as individuals — can contribute to a change. What is a 15% Solution? The term 15% Solutions was initially coined by Gareth Morgan. It is any first step or solution that you can do without approval or resources from others and that is entirely within your discretion to act. More succinctly put, it is something that you can start right now if you want to. 15% Solutions can be identified in relation to a shared solution you identified with your team. But it can also be deeply personal. We've seen examples ranging from "I will buy different colors stickies to distinguish types of tasks" to "I will refactor this class we're struggling with." And from, "Instead of staying silent and grumble, I will speak out when someone does this thing I don't like" to "When I get worried, I will focus on my breathing." Use it after a team conflict or other incident. You might feel overwhelmed about how to proceed, 15% Solutions helps you focus on setting the first small step in the desired direction. In the same groups, members help refine and clarify the 15% Solutions (5 minutes per person). The purpose here is to make the 15% Solutions as doable as possible and to make them smaller when needed. Another purpose is to explore how groups can help the individuals in achieving their 15% Solutions. In this post, we've explained the Liberating Structure "15% Solutions" and how we use this structure. It's a wonderful structure that can ignite big change by starting with small, individual contributions. We're always happy to hear your experiences or hear your suggestions. Published at DZone with permission of Barry Overeem , DZone MVB. See the original article here. Opinions expressed by DZone contributors are their own.